George Washington University: Members of the Students for Justice in Palestine (SJP) chapter tried to disrupt an event organized by GW’s pro-Israel organization MEOR. The event hosted a former Israel Defense Forces (IDF) soldier, Sergeant Benjamin Anthony. 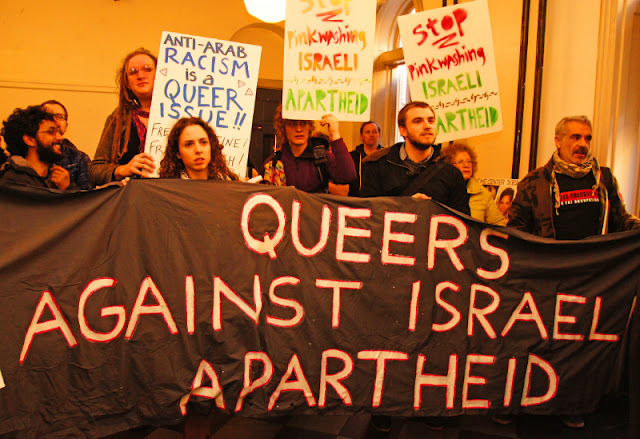 New York City: Approximately 100 members of Queers Against Israeli Apartheid (QAIA) gathered in the lobby of the LGBT Center to protest the Center’s decision not to host events related to the Israeli-Palestinian conflict. [In March 2011, the Center had decided not to host an IAW event.] Protesters held signs that read "Stop Pinkwashing Israeli Apartheid" and "End Israeli Apartheid," and accused the center of “succumbing to the outspoken in power” and “betray[ing] its historic mission.” After an hour indoors, the protest moved outside to the sidewalk. Be sure to check out our other posts on IAW, which can be accessed here.